President Obama may be on his 10th trip to Asia — but on this visit he will become the first sitting American president to visit Hiroshima since 1945, when 140,000 people died and the city was devastated after the U.S. dropped a nuclear bomb with hopes of ending World War Two and saving American lives. Obama began his trip in Vietnam on Sunday — his first visit to the country sharing a complicated political and military history with the United States. But this is no apology tour, the White House is quick to point out. The trip is designed to highlight the President’s continued pivot to Asia, specifically economic, trade and security cooperation and cement the President’s legacy as his second term winds down. Both Vietnam and Japan are seeking reassurances about a major twelve nation trade deal — TPP or the Trans-Pacific Partnership, that Congress has yet to approve. The White House is meeting with lawmakers individually to try and answer questions and bolster support. The bill remains stalled, it’s future murky; although mainstream Republicans have largely supported the trade package, including to some degree both leaders McConnell and Ryan. “We’re working to resolve a handful of key issues that have been flagged as particularly important by members of Congress,” Ambassador Mike Froman, the U.S. Trade Representative, told reporters during a briefing on the upcoming trip. It’s not clear if the TPP has the support to pass a lame duck season in Washington — and all three remaining presidential candidates have come out against it, including Democratic front-runner Hillary Clinton, who was part of negotiating the deal when she was secretary of state. If the deal doesn’t pass it could be a huge blow for economic cooperation between the United States, Vietnam, Japan and the other nations involved — and a huge blow for President Obama’s legacy. Vietnamese leaders are also hoping the U.S. will lift its arms embargo, something President Obama is considering, according to Ben Rhodes, his Deputy National Security Advisor. While some restrictions were lifted in 2014, the U.S. has not sold lethal weapons to Vietnam in decades. The embargo has remained in place largely because the U.S. has been pushing for more progress in Vietnam on human rights. Foreign policy experts believe lifting the arms embargo is something President Obama wants to do. "I think this will be discussed in the context of where this relationship is going, and it’s something that we’ll certainly be addressing in the bilateral meetings with the Vietnamese," Rhodes told reporters. 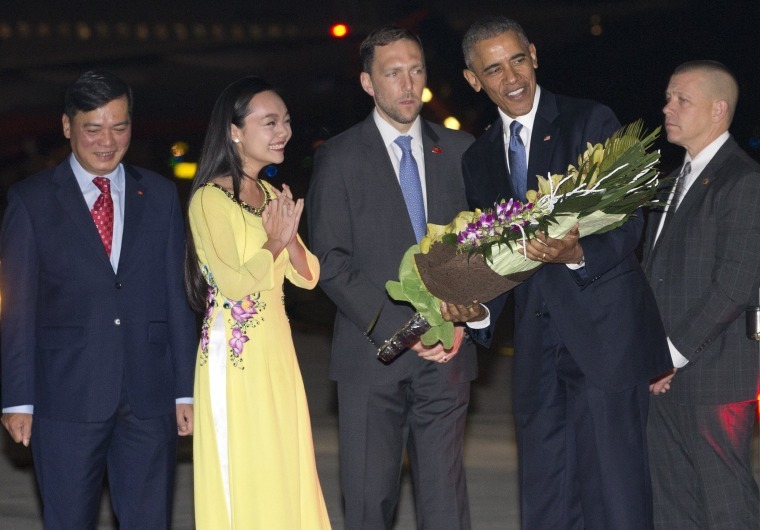 The deal is about more than just than Hanoi’s desire for American military hardware. It could ease Vietnamese reliance on buying defense systems from Russia. It would also show warming relations between the U.S and Vietnam, strong enough to send an important message to China over its recent incursions in the South China Sea. China’s ramped up its military presence in the international waters, claiming lands in the South China Sea as its own, even building on those islands surrounded by countries like Vietnam, the Philippines and Malaysia. Chinese officials have warned the U.S. not to provoke them over the issue without expecting retaliation. The administration claims not to take sides in the dispute, but insists on freedom of navigation in international waters. Japan is also concerned about what’s happening in the South China Sea and would like to see the Chinese respect those international waters. Trade and economic issues, however, will top the agenda with the President meets with Prime Minister Shinzo Abe around the G7 summit. Abe will also accompany Obama to Hiroshima, where he will lay a wreath at the Hiroshima Peace Memorial and reflect on the lives lost and cost of nuclear war. Secretary of State John Kerry made the same trip in April, a test-run, said Mireya Solis, a Senior Fellow at the Center for East Asia Policy Studies at the Brookings Institution. Senior White House officials say the president will look forward and talk about a world without nuclear weapons, but there are no plans for a wide-ranging speech. Instead he will offer brief reflections, a stark contrast to the sweeping foreign policy speech he gave in Prague in 2009 where he set ambitious goals for ridding the world of nuclear weapons in front of a crowd of tens of thousands. “We certainly acknowledge there is more work to be done. But we do believe that we have bent the curve in the right direction,” Rhodes said. Rhodes points to the fact that there are no new members in the nuclear club, as well as the New START treaty, frequent nuclear security summits and the Iran deal as major progress. But, a nuclear-free world appears less likely now than when Obama took office, according to Richard Fontaine, President of the Center for a New American Security. Relations between Russia and the U.S. are chilly. The new START treaty includes $300 billion for nuclear modernization. The nuclear security summits that Rhodes pointed to could end with the Obama presidency. Solis acknowledges the President hasn’t met his ambitious goals, but says the visit to Hiroshima is a continuation of his 2009 promise. “By coming into direct contact with the devastation, it’s a very significant platform and message,” Solis said.